The new opening of a location of Zachys in Washington, DC is a big deal for the local wine market. Even though the location won’t have a retail storefront – at least for now – bringing one of the most influential names in wine to the District says something about the growing power and sophistication of the market here. 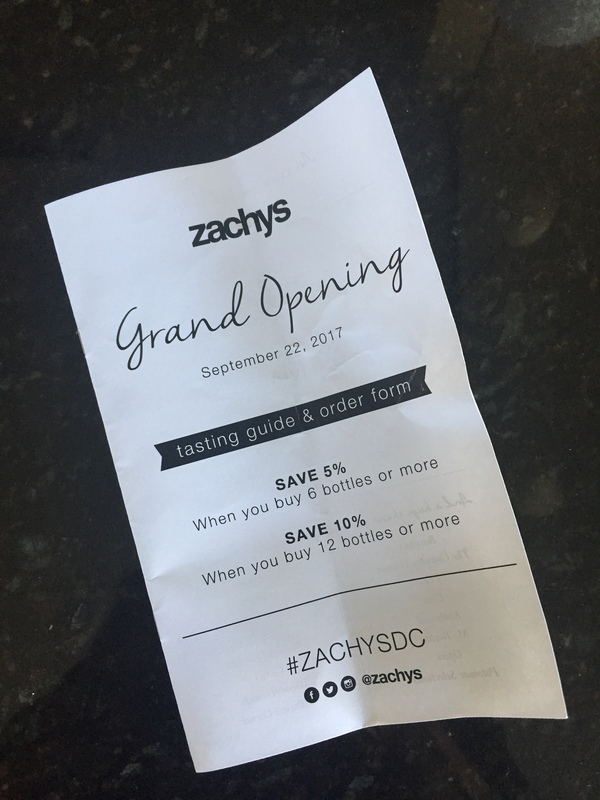 Zachys is bringing a number services to DC: wine storage; direct-to-consumer sales of wines otherwise not offered DTC to DC customers; tastings and classes; wine dinners; a customized corporate tasting service; collection assessment; other TBD events; and, for the first time in thirty years, a live wine auction. That last one isn’t an insignificant deal. Wine auctions signal an opportunity to at least be around, if not acquire, the world’s best and often rarest wine. Putting aside for now the recent past proliferation of fake wine facilitated in part by wine auctioneers, including Zachys – a topic to be discussed in an upcoming Good Vitis review of In Vino Duplicitas – Zachy’s DC existence means a new and much higher level of access in DC to wines that likely wouldn’t otherwise be available to locals. While I imagine the best of Zachys’ lots will remain the purview of its New York auctions, Zachys wouldn’t have made the decision to enter the DC market if it didn’t think our market wasn’t craving a higher level of wine. Wine auctions are held in the biggest, most prestigious wine markets in the world: New York, London, Hong Kong, Geneva, and Paris are the standards. Although the biggest general auctioneers like Christie’s and Sotheby’s haven’t visited DC in a while, within the world of wine auctions Zachys is among the very top and their decision to auction wine in DC – their appropriately named inaugural “Capital Collection” auction will take place on October 27th and 28th of this year – marks Washington’s entrance onto that top stage, something that shouldn’t go unnoted. Last Friday, I attended a grand opening party at Zachys, which featured sixteen different tables pouring wine from California, Virginia, France and Italy ranging in price from $14 to $1,110. From top to bottom these were good wines, many hitting their price point with impressive quality. The ability to source such a lineup is indicative of what I think Zachys is going to bring to my local market: a large range of impressive wines where anyone – even those who will never lift a bidding paddle – can find what they want. Welcome to town, Zachys! 2014 MacMurray Range Central Coast Pinot Noir: At $19.99 it’s the best $20 California pinot noir I’ve had. 2013 RdV Vineyards Virginia Rendezvous Red Blend: While many feign spending $70 on a wine from Virginia, it stood out among the domestic offerings as the most multidimensional. 2015 Domaine Leon Boesch Sylvaner Les Peirres Rouges: a Sylvander for Sylvander haters and lovers, everyone should try this pleasurable $16 wine. 2014 Domaine Blain-Gegnard Chassagne-Montrachet 1er Cru La Boudriotte: The best white Burgundy of the night for me, I placed an order. Hard to beat at $59.99. 2014 Jl Chave Selections Saint Joseph Offerus: Year-in and year-out, this is a classic from one of the regions of the Rhone valley producing some of the prettiest syrahs. The 2014 doesn’t disappoint, and is a real value at $32.99. 2008 Chateau Larcis Ducasse St. Emillion: Really popping right now, it has all the classic St. Emillion notes and is far from poorly priced at $64.99. 2004 Roberto Voerzio Barolo Rocche dell`Annunziata Torriglione: From a 3 liter. Dear God, this was the best wine of the night. The bittersweet cocoa that comes with age on a fine Barolo is out in force. What a pleasure and treat. 2012 Antinori Marchesi Pian Delle Vigne Brunello Di Montalcino: Despite having attended the Consorzio del Vino Brunello Di Montalcino’s 2012 vintage tasting in New York earlier this year, I hadn’t yet had this marvel of a wine that is, for me, a standout wine in a standout vintage. I grabbed a few for myself.